Yesterday, I had the pleasure of watching Tennessee Williams’ play Vieux Carré directed by Robert Chevara at the King’s Head Theatre, London. I’ve always been a fan of fringe theatre as it has that unique ability of being an intimate experience, yet without any less of the quality of the bigger productions. I had however never heard of Tennessee Williams until a few days ago, so didn’t really know what to expect from one of his plays. I read about him beforehand, but it’s not the same as seeing one of them. Written with his characteristic passion and compassion for the damaged and dispossessed, Vieux Carré is in many ways the condensation of all Williams’ plays, yet it is unique in its depiction of his loneliness, despair and longing for something new. In a nutshell: it’s a play about a young writer who is coming to terms with his homosexuality, among the residents of his shared home whom themselves have many issues to deal with. Stripped bare of a huge set and endless scene changes that have dwarfed earlier productions, the inmates of ‘722 Toulouse Street’ in the French Quarter of New Orléans come into dazzlingly sharp focus. Many of Williams’ great plays delve into his mother’s story, or the events of his sister Rose’s tragic life – whereas this one is a search for his own truth as he tried to understand it. The way in which Tennessee throws together in one play the issues of sexuality and race combined with humour, is really intriguing and he gets it just right. I was hooked on the play from beginning to end, and that takes some doing considering the first act is 65 minutes long and the second 55 minutes with a 15 minute interval! Throughout, I didn’t know what was going to come next and that made the play all the more exciting. It was like a good book, you just want to keep turning the pages of. 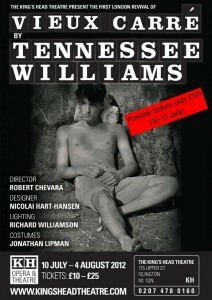 Robert Chevara has created a great adaptation of the play, something Tennessee Williams would be proud of. Tom Ross-Williams‘ performance along with the rest of the cast like Eva Fontaine, is outstanding. Oh yes, the last time this play was in London was the year of my birth! Vieux Carré is on at the King’s Head Theatre, Islington until 4th August. This has been a… really impressive, ‘View from the Bottom’.